Mushrooms are known for their meatiness in the vegetable world, but they are not vegetables, they’re actually not even plants. In fact, mushrooms are a fungus, and they’re my favourite. 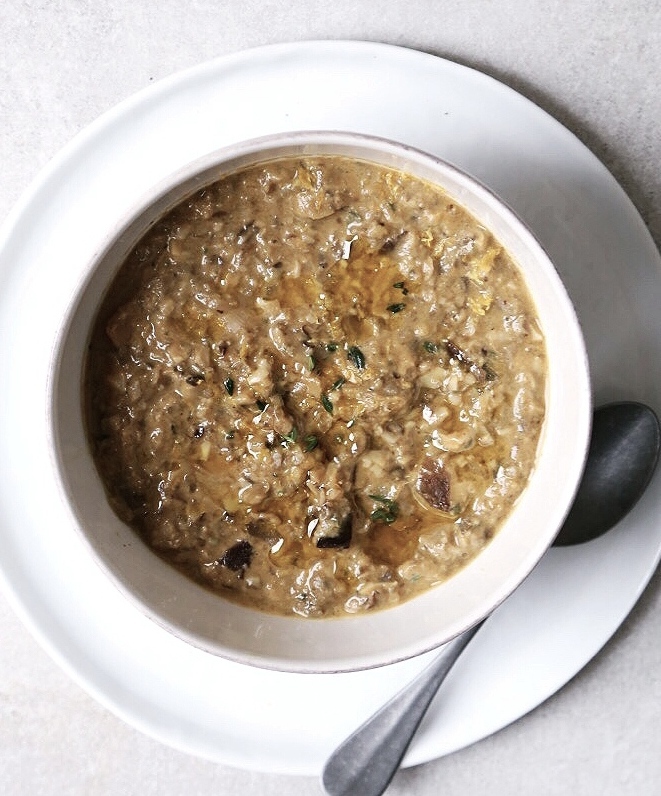 I absolutely love a good mushroom soup, but it’s important that the soup isn’t pureed because the best part of mushrooms is it’s meaty texture. Mushroom soup is often paired with cream. I wanted to make the perfect ‘creamy’ vegan mushroom soup. In place of cream I used cashews. Cashews are a great cream alternative because they are pretty neutral in flavour. This recipe turned out beautifully and is worth making before the winter is over! You will notice that a bunch of my recipes use super food ingredients such as lucuma, turmeric, and chaga. They are medicinal plant-based ingredients packed with high levels of vitamins, minerals, and antioxidants. I find the ancient uses and health benefits of these ingredients very interesting and I hope to include an array of these foods in my recipes moving foreword. In this soup I incorporated chaga mushrooms. For centuries chaga has been consumed for it’s nourishing benefits. For instance, indigenous Siberians have been known to use it in their soups and stews to prevent degenerative diseases and boost their endurance. Today, research suggests that chaga mushrooms are powerful antioxidants, immune boosters, help with digestion and have anti-cancer properties. The recipe calls for ‘tea-cut’ chaga mushrooms, which are mushrooms that are dried and cut down to small pieces. The chaga flavour in this soup is very subtle. If you can’t source chaga feel free to omit it altogether, the recipe is delicious without it. However, you should be able to find chaga at many health food stores or you can order it online here. To prepare the cashew cream, soak cashews in boiling hot water for at least 30 minutes. Drain cashews. In a high speed blender add the cashews and 1 cup of water. Blend until very smooth. Set aside. In a large pot, bring vegetable stock and chaga mushrooms to a boil. Simmer for 10 minutes. With a fine mesh sieve, strain the liquid into a bowl and set aside. Chaga mushrooms can be saved for another time*. Give the pot a quick rinse. Over medium heat add olive oil and cook onions until golden. Add the mushrooms and cook until they have softened and most of the moisture has been released and evaporated, about 8-10 minutes. Add the thyme and garlic and cook for another 2 minutes. Add the chaga stock and simmer for 15 minutes. Add the soup to blender with the cashew cream. Blend for a few seconds until soup is pureed but still chunky. Stir in lemon zest and juice and season with salt and pepper. Serve hot. * You can re-use chaga mushrooms 2-3 times. Just rinse and store them in the freezer. This entry was posted in Soups and tagged cashew cream, chaga, healthy, nourish, soup, superfood, Vegan, Vegetarian. Bookmark the permalink. Where do you buy raw Chaga mshooms? I’ve bought them at health food stores. You can also find them on amazon!